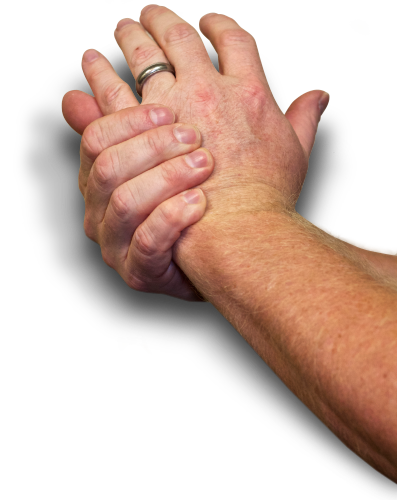 Arthritis comes in many forms and can wreak havoc on our lives by interfering with our daily routines. Learn about ways to beat arthritis pain and improve your quality of life. 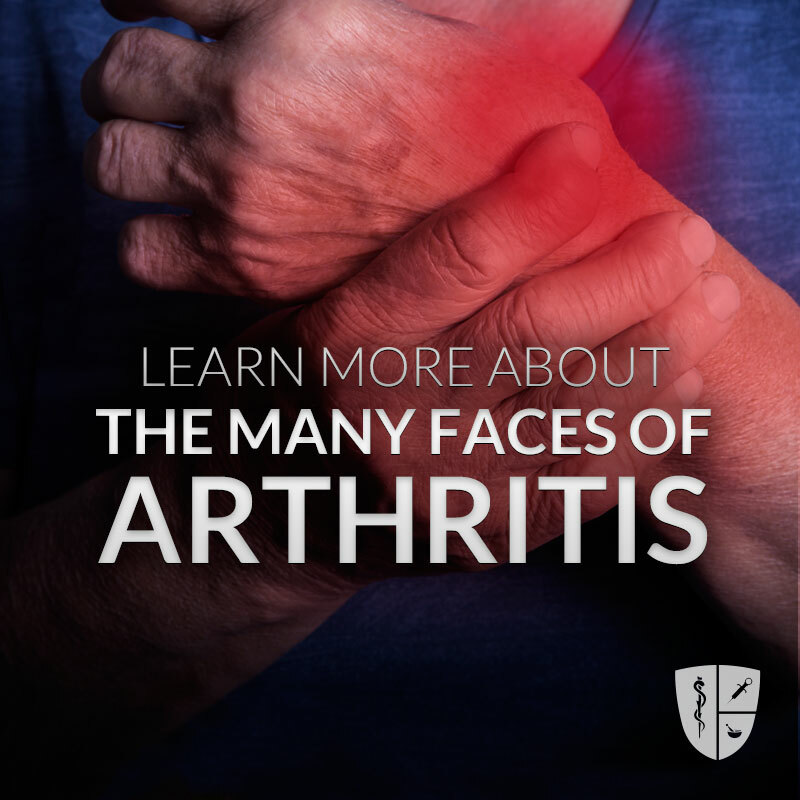 According to the Arthritis Foundation, arthritis is a complex family of musculoskeletal disorders consisting of more than 100 different diseases or conditions that destroy joints, bones, muscles, cartilage and other connective tissues, hampering or halting physical movement. When treating arthritis it is important to have an accurate diagnosis which sometimes can be challenging and time consuming. Listed here are brief descriptions from the Arthritis Foundation of some more common diseases. Ankylosing spondylitis (AS) is a chronic inflammatory disease that primarily affects the sacroiliac joints (where the spine attaches to the pelvis), spine, and hip joints. Ankylosing is a term meaning stiff or rigid and spondylitis means inflammation of the spine. Losing 10-15 pounds may decrease the risk of developing OA by 50%. Fibromyalgia is a syndrome characterized by long-lasting widespread pain and tenderness at specific points on the body. The term “fibromyalgia” means pain in the muscles, ligaments and tendons. Although not defining characteristics, sleep disturbances and fatigue are also integral symptoms of fibromyalgia. This condition is referred to as a syndrome because it’s a set of signs and symptoms that occur together with no known cause or identifiable reason. Although considered an arthritis-related condition, Fibromyalgia is not truly a form of arthritis because it does not cause inflammation or damage to the joints, muscles or other tissues. It is, however, considered a rheumatic condition because it impairs the joints and/or soft tissues and causes chronic pain. Fibromyalgia is an especially confusing and often misunderstood condition. Because its symptoms are quite common and laboratory tests results generally are normal, people with Fibromyalgia were once told that their condition was “all in their head.” However, medical studies have proven that Fibromyalgia does indeed exist, and it is estimated to affect about two percent of the U.S. population today. Although Fibromyalgia has no cure, it isn’t a progressive disease, meaning that it will not get worse over time and it’s never fatal. With a treatment plan that integrates several modalities that include exercise, rest, stress relief, coping skills and medications, people with Fibromyalgia can live happy, productive lives. Gout is a form of inflammatory arthritis that causes sudden, severe pain, swelling and tenderness – most often in the large joint of the big toe. However, gout isn’t limited to the big toe; it can affect other joints including the feet, ankles, knees, hands, wrists, elbows and sometimes soft tissue and tendons. It usually affects only one joint at a time, but it can become chronic and, over time, affect several joints. Lyme disease is an infectious disease that can cause arthritis as one of its symptoms. The infection occurs when a deer tick that is infected with the spirochete bacteria Borrelia burgdorferi bites a human and transmits the bacteria to the human. The bacteria usually produce a rash and mild flu-like symptoms at first. These symptoms are often not noticed or are ignored by the person. After weeks and months of untreated infection, more symptoms may develop, including heart and nervous system problems and arthritis. Lyme disease can be cured with antibiotic treatment. If the disease is caught early, treatment does not take too long and is very successful. If the disease has gone on for a long time before antibiotics are begun, treatment may take a while and it can take months for the symptoms to clear up. Anyone who is bitten by an infected tick can develop Lyme disease. Ticks in different sections of the United States and Europe are most likely to be carrying the bacteria. Endemic areas of the United States include the northeastern, middle Atlantic and north central states, as well as some areas of the north Pacific coast. Children tend to get Lyme disease more often than adults because they tend to play in the tall grass and woods where deer ticks live. Myositis is defined as the inflammation of muscles (“myo” means muscle and “itis” means inflammation). The inflammatory myopathies are a group of disorders characterized by inflammation and weakness mainly of the muscles closest to the trunk of the body (proximal muscles). These disorders include polymyositis, dermatomyositis and inclusion body myositis. Myositis may be associated with inflammation in other organs, including the joints, heart, lungs, intestines and skin. In dermatomyositis, a rash develops in addition to the muscle inflammation. Today, an estimated 27 million Americans live with OA, but, despite the frequency of the disease, its cause is still not completely known and there is no cure. In fact, many different factors may play a role in whether or not you get OA, including age, obesity, injury or overuse and genetics. Your OA could be caused by any one or by a combination of any of these factors. Psoriatic arthritis (PsA) is a type of chronic inflammatory arthritis associated with the chronic skin condition psoriasis, which is believed to be an inherited condition. Psoriasis, which affects about 2 percent of the U.S. population, most often causes patches of thick, reddened, irritated skin with flaky, silver-white patches called scales. Psoriatic arthritis typically appears about 10 years after the onset of psoriasis, which can manifest at any age, though most people are diagnosed between the ages of 15 and 35. Rheumatoid arthritis (RA) is a form of inflammatory arthritis and an autoimmune disease. In RA, for reasons no one fully understands, the immune system – which is designed to protect our health by attacking foreign cells such as viruses and bacteria – instead attacks the body’s own tissues, specifically the synovium, a thin membrane that lines the joints. As a result of the attack, fluid builds up in the joints, causing pain in the joints and inflammation that’s systemic – meaning it can occur throughout the body. An estimated 1.3 million people in the United States have RA—that’s almost 1 percent of the nation’s adult population. There are nearly three times as many women as men with the disease. In women, RA most commonly begins between the ages of 30 and 60. It often occurs later in life for men. Lupus is one of many disorders of the immune system known as autoimmune diseases. In autoimmune diseases, the immune system turns against the body it’s designed to protect for unknown reasons. Most often when people speak of lupus, they are speaking of systemic lupus erythematosus (SLE) and it is what this article primarily is about. SLE is an inflammatory, autoimmune disease that affects nearly every organ system in the body, including the skin, joints, kidneys, heart, lungs, and central nervous system. SLE is only one type of lupus. A tendon is a cord of tough tissue that connects muscle to bone. The tendon is surrounded by a sheath that protects and lubricates the tendon. This sheath is lined by a layer of cells called the synovium. Occasionally, the tendon will become inflamed (called tendinitis) or the tendon sheath will become inflamed (called tenosynovitis). These conditions together are known as tendinitis and result in pain, stiffness and sometimes swelling. Tendinitis usually is caused by a specific injury or by repetitive overuse, especially when using poor body position. Tendinitis can occur in young athletic people in response to sports injuries and overuse. However, tendons become less flexible with aging and tendinitis is common in middle aged and older adults. In general, tendinitis can occur suddenly, may last for days, weeks or longer, and then go away. It can, however, occur again in the same place. When properly treated, it general doesn’t result in permanent damage or disability.